TSR Series Rotary Table - Motion Index Drives, Inc. The Motion Index Drives TSR Series Rotary Tables encompass a range of sizes that offer solutions for many applications. Four different models are available in our standard line: TSR600, TSR1000, TSR1400 and the TSR1900. 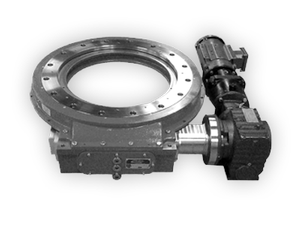 TSR Ring Index Drives are ideal for applications that require large, open center accessibility for tooling and other devices. The TSR Series can be manufactured with a fixed number of stations or as a flexible turntable with a servo motor or standard AC brake motor with encoder. Custom indexing and dwell periods available for synchronization.